I hope this posting finds you doing well and loving life. What a fabulous time of year. The summer is waning, and fall is waiting in the wings. Absolutely delightful! So, take a few moments to sit, relax, and savor the moment. Your “to do” list can wait as we ponder life-giving questions and think deep thoughts. Over the past four months, I have enjoyed researching a new program that I will offer later this year entitled “What’s Next?” Historically, the topic of the afterlife generated considerable discussion and debate, as evidenced by the volume of information I discovered from a myriad of sources. Although we live in a death-averse society, it seems that most of us are curious about what happens after we die. Although I gathered information from philosophers, theologians, physicians, psychologist, psychiatrists, physicists, and academics, I have to be honest with you. I don’t have THE answer as to what’s next! In fact, after studying such a variety of perspectives on the subject of the afterlife, I am more confused than ever as to what might happen when I die! But the one thing about which I am certain is this. 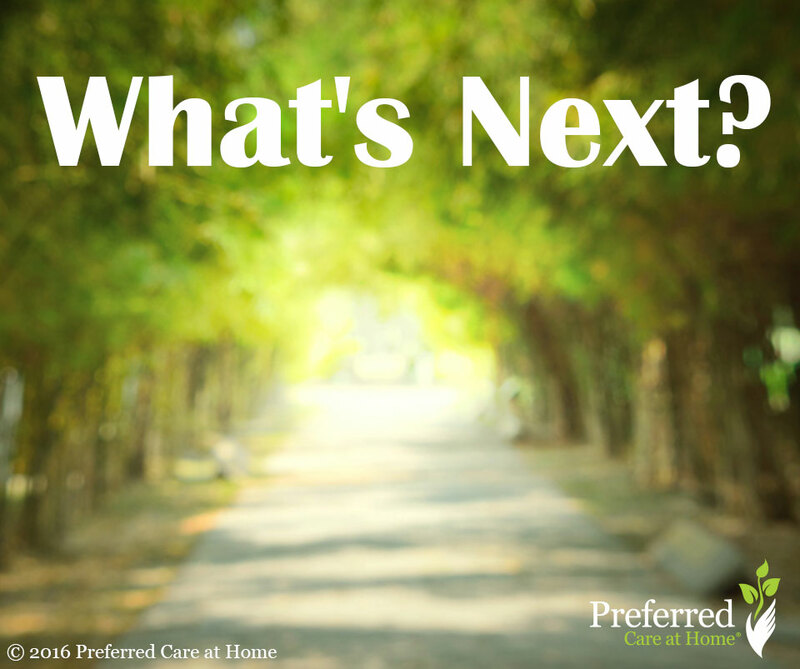 Considering the question— “What’s Next?”—is profoundly important. It’s important because what we believe may happen after death informs how we choose to live in the here and now. Additionally, our expectations of the afterlife directly impact our grief and mourning process after the death of family (furry family as well), friends, and colleagues. This year, I’ve had far too many opportunities to witness how people perceive what’s next. My brother died in March. A dear friend died in July. A colleague of my housemate died in August. In each situation, people expressed their hopes for the deceased through prayers, stories, and reflections predicated on what they believe to be true of the afterlife. A heavenly home. A loving and welcoming God. A peaceful rest. A beautiful garden. The possibility of reincarnation. Nothing—death is the end of the road. Everyone had a unique idea of what the afterlife would offer those we had known and loved. I also heard some expressions of concern—fear—that the deceased might suffer due to lack of faith or the consequences of sin. So, our expectations of the afterlife can offer both solace and trepidation about what’s next. As I contemplate how to present this thought-provoking topic, I realize my ultimate goal is not to reveal THE resolution to a heretofore timeless mystery. My goals are much more humble and realistic. I merely want to pose the question. Review the historical development of the concept of the afterlife. Recognize the similarities and the distinctions between and within various belief systems. Highlight the fact that the afterlife has been and will continue to be an evolving concept as we continue to learn more about ourselves and the universe in which we live. For now, I am content admitting that I don’t have THE answer to “What’s Next?” But I will continue to consider the possibilities. A good thing indeed.